Yosemite cozy cabin with character! Secluded 2.73 acres bordering 2,000 sq. miles of Sierra National Forest. At just under 1,000 sq. 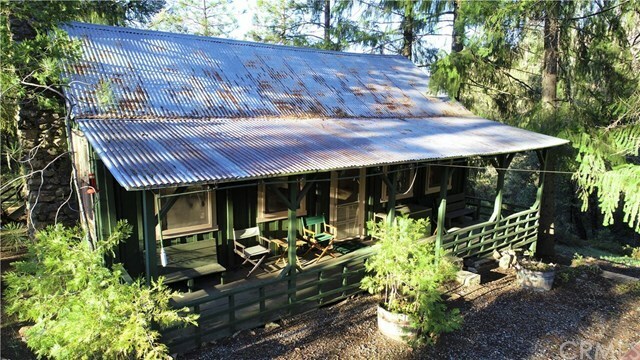 ft., this two bedroom, one bath cabin comes completely and tastefully furnished with gorgeous antique furniture and ready for you to move in! Forget about the high cost of heating, this home has a real fireplace with lots of firewood available on site! Two street legal dirt bikes and a 4WD car also included! As evidenced by the original, fully operational vintage propane gas light fixtures in each of the main rooms, this turn of the century cabin has some tales to tell. Relax under the shade of the covered porches. Follow the gentle walking path, past the magnificent ancient oak tree, down to the banks of the free flowing seasonal creek. Meditate in the peaceful serenity surrounding the scenic waterfall, complete with a beautiful stand of horsetail reeds, moss covered boulders, and lush green ferns. Imagine heading out on horseback, motorcycle, quad, or 4WD following the same route used by the Mariposa Pioneer wagon train. Wawona, with a 9 hole golf course in Yosemite National Park, is only about 7 miles away via National Park service roads. Mariposa/ Yosemite Airport is only 35 minutes from this private Getaway. What a great place to escape the Rat Race! Directions: From Mariposa: Hwy 49 S to Chowchilla Mtn. Rd.